Share this product and receive a $2.24 sharing discount. The cross, with its powerful symbolism of the Gospel Message of Jesus Christ, has endured for 2000 years. Rebecca's mission through her artwork of wrapped wire in the form of a cross has had profound impact on the many customers who have purchased her work. 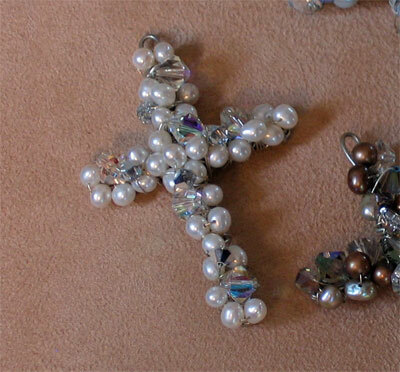 Rebecca has used a variety of size and shaped beads, pearls, and glass along with silver wire to create these lovely crosses. Each measure 3" and can be hung on an existing chain or string of pearls. Additionally, you can combine them with a leather cord or an organza ribbon necklace with a clasp. The crosses measure 3" tall and 2" wide. The loop for hanging is large enough to fit over most existing chains. 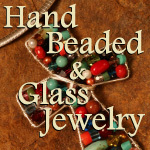 Otherwise you can purchase a sterling silver clasp. See above. In addition to being used as jewelry, these 3" crosses can be used as wall/dresser ornaments by stringing with a satin ribbon... or even a baby crib ornament. The pale blue is popular with brides as an addition to their garter under the wedding dress.